The Cellular and Molecular Imaging Facility (CMIF), one of two core facilities managed by ORIED, has acquired a Zeiss LSM 880 confocal with Airyscan. This purchase was made possible by a successful 2016 NSF MRI grant (#1624613) led by Dr. Marcela Rojas Pierce (Plant and Microbial Biology) and co-PIs Drs. Ross Sozzani (Plant & Microbial Biology), Greg Reeves and Jason Haugh (Chemical & Biomolecular Engineering), and Eva Johannes (CMIF Director). Matching funds were provided by ORIED. The instrument has been installed and tested, and is ready for use by campus researchers. In order to introduce this new resource to the campus community, CMIF will hold two events in May. 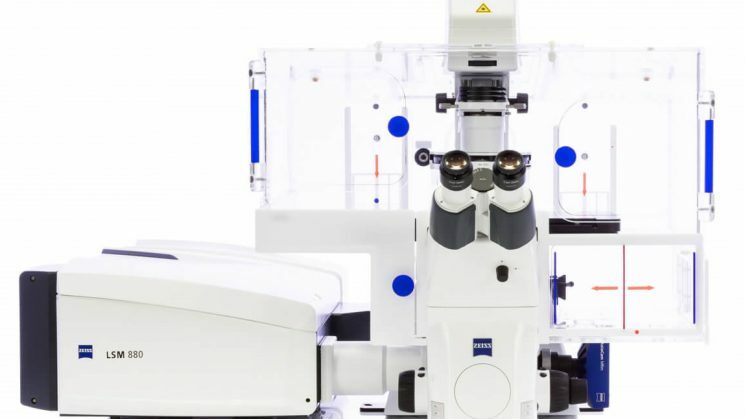 Zeiss imaging specialist Dr. Oliver Tress will give a technical review of the new state-of-the-art equipment, highlighting the capabilities of the LSM880 with Airyscan. A Q&A session will follow allowing researchers to ask questions to confirm the suitability of their specimens or experimental needs. Campus researchers are invited to see the microscope in action at CMIF’s Open House. Technicians will have samples ready to demonstrate the equipment and the types of experiments that can be done. Researchers are welcome to bring their own samples to try; CMIF will try to accommodate as many samples as time and attendance allows. More information about the specific optics and modules that are available on the LSM880 will be posted on the CMIF webpage.